The Anglo-Peruvian Trading Company (anglo-peruvian.com) sent me some samples of their wines: my first experience of wines from this South American country that lies to the north of Chile on the west coast of South America. The wines come from three producers, the best-known of which is probably Tacama, some of whose vineyards where established in the 16th century and who can count the eminent Emile Peynaud of Bordeaux amongst their past consultants. Viña Ocucaje was founded in 1898, whilst Vista Alegre, founded 1857, also has a reputation for quality. Peru does not enjoy the reputation of either Chile or Argentina, and indeed the wine industry is nowhere near the quality and level of development. Yet, the wine industry is a long established one, and some high quality vineyards and wineries do exist. Grapes (mainly Muscat) are also grown for distillation into Peru’s most famous alcoholic product, Pisco. A blend of Sauvignon Blanc, Viognier and Chardonnay, this wine from Viña Tacama pours a light gold colour and has a fresh, lightly tropical aroma with a definite apricot note and glimpses of quite ripe Sauvignon notes of lychee and guava. On the palate there’s a fruit cocktail syrupy quality to the flavour, with a slightly blowsy Viognier character dominating. But this is a bone dry wine, and a pithy lemon acidity runs through it, giving an edge to that just ever so slightly cloying fruit character. A powerful wine this, though alcohol is modest at 13%, and it finishes with good length. Vista Alegre is one of the largest estates in Peru, and has been involved in wine since 1857. This Pinot Blanc is made in stainless steel, and has a nicely ripe, fruity aroma with notes of peach and yellow plum, as well as some herbal and tiny smoky nuances. With only 11% alcohol it is light and quite crisp on the palate, though a touch underpowered, with the fruit not really pushing through the mid-palate. It is nevertheless quite elegant, with a dry, quite taught acidity and a reasonably long finish. Enjoyable, if a little simple and short. Viña Ocucaje has been in the drinks business – Pisco and wine – since 1898. This non-vintage Chardonnay has a slight note of oxidation on the nose, and unfortunately a touch of corkiness too. There’s some pear and melon fruit that is quite cool and subtle. On the palate the TCA taint is fairly obvious, giving a slightly dirty character which is a shame, because the fruit and balance seem pretty good. Tacama’s Gran Tinto is a 12.5% alcohol blend of Malbec, Tannat and Petit Verdot that pours a deep crimson colour. The nose has copious ripe, black fruit, with plummy depth and a touch of sweet, damp earth and violet. On the palate there’s a little lick of firm, liquoricy structure here, with a nicely tart and juicy black cherry acidity, overlaid with much softer blackberry and spicy fruit compote flavours. A nice, easy-drinking wine this with very good balance. Seleccion Especial is one of Tacama’s top wines, a blend of Tannat and Petit Verdot, with what smells like a touch of high quality older French oak. This deep, crimson red wine has a lovely nose, with a gentle cedar and smoke quality set against plenty of creamy, ripe, raspberry and blackcurrant fruit. There’s a nice, kirsch-like element of brightness here, and also a suggestion of minerality in a really quite complex profile. The palate has a lovely fruit quality, with more of that ripe, creamy berry character and a nicely spicy, firm oaky, tannic background. This has very good acidity too, adding a crispness and poise into the finish. This is a well-mannered wine which some may find lacks a little mid-palate weight and depth, but it is beautifully composed and quite long and elegant. Ocucaje, meaning “Between Hills”, lies south of Lima, and the vineyards were established in the 1930s with vines selected from France, Italy, Spain, Portugal and the Rhine. This Malbec/Cabernet blend pours a medium ruby/crimson colour, and has an immediately cedary, smoky, spice and tobacco nose with good black fruit beneath. On the palate there’s an earthiness and pleasant touch of leafiness about this, and even a tiny echo of Brettanomyces that actually sits well in a wine that is very classically European in its profile. The tiny metallic edge on the palate does not detract from a savoury, grainy black fruited wine with a good spine of rustic tannins and acidity. 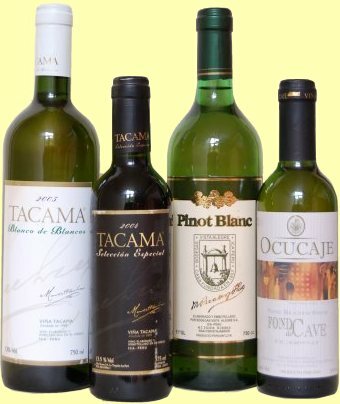 For stockists of Peruvian wines in the UK, see wine-searcher.com.